The Toy Dolls are an English punk rock band formed in 1979. Departing from the angry lyrics and music often associated with punk rock, The Toy Dolls worked within the aesthetics of punk to express a sense of fun, with songs such as "Yul Brynner Was A Skinhead", "My Girlfriend's Dad's A Vicar" and "James Bond Lives Down Our Street." There is often alliteration in their song titles (e.g. "Peter Practice's Practice Place", "Fisticuffs in Frederick Street", "Neville is a Nerd"). They are probably best known however for their sole UK hit, a punk-rock cover of Nellie the Elephant. As of 2007, the band has had 14 different drummers and 12 different bassists. Olga is the only remaining original member of the band. After Olga, drummer Martin Yule had the longest tenure in the band (1987–1999). Yule currently owns a shop in Sunderland called "Hotrats." Former drummer Dave "the Nut" Nuttall owns Jalapeño Drums (a custom drum company based in Lancaster, Lancashire). The current lead singer/guitarist with The Stranglers Baz Warne also had a stint with the band. Olga has played bass on tours with the U.S. punk band The Dickies, and also with The Adicts. Gary Dunn, former bassist of The Toy Dolls (1997–1999), now teaches music at City of Sunderland College, and former drummer Trevor 'The Frog' Brewis now teaches music at Middlesbrough College, though Olga moved away from the north east of England a number of years ago, and now lives in London. 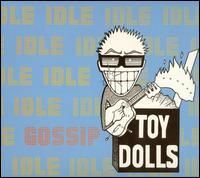 It has become a tradition to give a special nickname to every Toy Dolls member.